I know, I’ve fallen off the old craft wagon, and can’t seem to climb back on. After quite some time away from this blog, I think it’s time to put the old girl to sleep. Thanks for stopping by and leaving comments. They have always brightened my day. 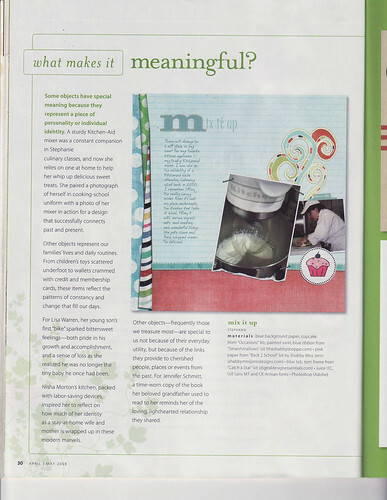 I was so excited the other day when I found out that the new issue of a national digital scrapbooking magazine was out and was even more excited when I actually got to see my digital layout in the magazine! I just started digitally scrapbooking in September, after over five years of paper scrapping. In November, there was a call to create a layout of an important object in my life and so I threw together a page all about my kitchenaid mixer (gotta love a kitchenaid)! I right away showed my daughter Leah the page and she yelled “we’ve got to show someone” right in the middle of the bookstore. So cute! Happy crafting everyone! Over and out! It was one of those weekends where everything fell right into place. It started on Saturday which was a planned girl’s day out. Myself and three of my good friends headed into New York City to see Legally Blonde on Broadway. It was a perfect feel good show, with upbeat music and funny dialogue. Click on the below clip to see the beginning of the show. After heading back over the Hudson river, we all had dinner together and enjoyed the fact that there wasn’t a high chair or snotty nose at our table. On Sunday my almost six year old daughter and I went to Chinese school and then hit the bookstore afterwards for some mommy/daughter browsing. Last night I sat down to watch some football goodness and was thrilled by the HUGE NY Giants win last night (yep, I’m a die hard Giants fan, having had it drilled into me since I was a toddler)! It was the perfect (and very exciting ending) to a great weekend! Sorry I’ve been MIA around here – I have been spending a lot of my free time reading, so I update my book blog much more often. Stop on by if you have a chance – I will be hosting a book giveaway there in a couple days. I hope you all had a wonderful holiday! See you in 2008! By the way, I can’t take credit for these digital layouts – they were pre-made and came with my recent order of this holiday kit from Shabby Princess. Who said there isn’t any crafting going on here? Actually, I might have said that, only because it is was true. In comparison to last year when I was busy knitting this bag, making these cute ornaments and hanging up our homemade gumdrop wreath, it has been a virtually dry crafting season here. I think it’s due to the fact that now I have two little ones running around the house and I’ve been spending a lot of my free time baking, reading books, catching up on my scrapbooking and enjoying the season. One thing we did get to do recently was to take a day trip with our neighbors to visit the tree in New York City. 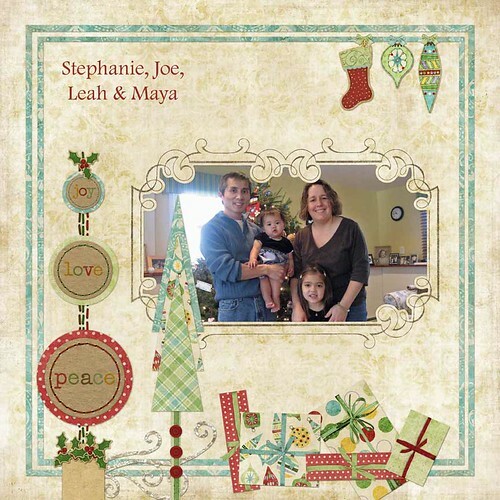 I found this little mini-‘Tis the Season tin album from Shabby Princess (an online digital scrapbooking store) and put it together last night. 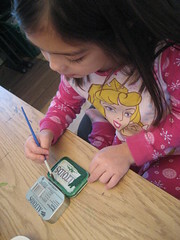 This easy project uses an Altoid tin, which you first sand lightly and paint. 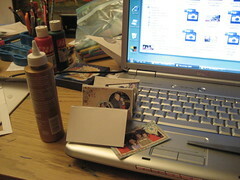 Once it is dry, you then follow the directions to include your photos in the pre-made digital pages on your computer. Once printed out, all you need to do is glue it in place. 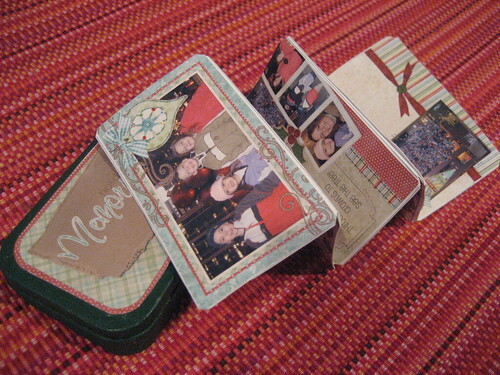 Add a ribbon to this accordion style mini-album and you are done! It turned into a really cute photo album to commemorate our day in the city. I have been doing digital scrapbooking for a few months now, but this is the first time I delved into a hybrid project. I will be giving one to my neighbor as a little gift and making another one for Leah to keep. You know the rest of the song, don’t you? Yesterday started out as a snowy day, just perfect to put me in the Christmas decorating spirit. Since the roads weren’t too bad, I decided to go pick up the tree (normally this is a family event, but since it was, and still is, bitter cold out I decided to go myself). I could only imagine a whiny five year old and freezing 13 month old at the tree farm wouldn’t have been all that merry. While I was gone, Leah (along with her Dad and with Maya safely in her highchair) decided to surprise me by unpacking and putting together our nativity scene. She was so excited when I came home and yelled “happy Christmas” when I walked through the door. This is the first time we have ever put the set on the buffet in our living room and I love the way it looks. 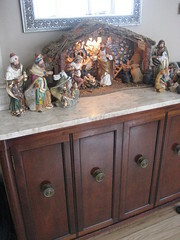 I think that this will be the spot for our nativity scene for years to come. While Joe took Leah to Chinese school and Maya was napping in the afternoon, I strung the Christmas tree with lights. 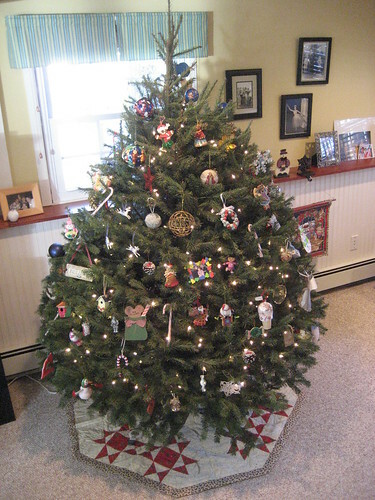 I think that this might be the fattest tree we’ve ever had. Unlike last year’s christmas tree disaster, I didn’t have to put it in the corner of the room to hide some, eh-hem, imperfections. 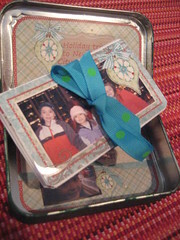 After I popped dinner into the oven, Leah and I then came downstairs to decorate it with ornaments. I love to take each ornament out and think about where or when I got it. The oldest ornament on my tree is one from a trip to Maine I took with my parents when I was only ten years old. 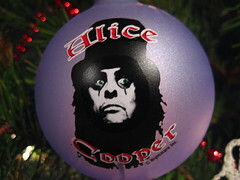 As far as the weirdest ornament, the honors have to go out to my really cool Alice Cooper ornament, given to me by my girlfriend Ariel many, many years ago. It always gives me a giggle when I unwrap it! Hope you had a wonderful Thanksgiving! 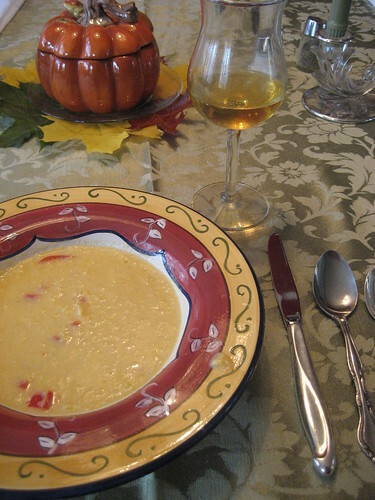 I made this yummy soup today – click here to see the recipe. Our light snow from yesterday turned into an actual snow storm today. 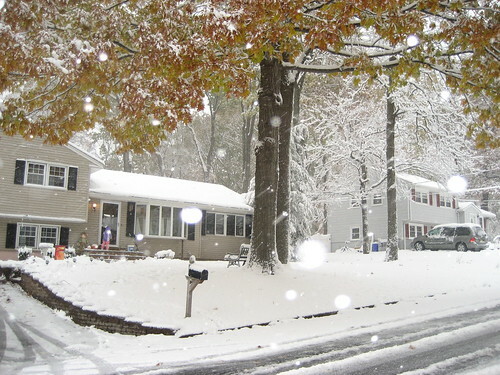 Here’s that same view, just with a few inches of snow. Leah was thrilled to find out that it was a snow day – the first one since entering elementary school. Check out Maya looking out the storm door at Leah and Joe playing in the snow. I guess I’ll have to get her a snowsuit sometime soon!